Portable headphones are equipped with patented, Noisebuster noise-reduction technology (NC-II noise cancellation) to reduce unwanted background noise that interferes with your listening pleasure. Microphones in the headphones detect that ambient noise. The headphones generate a precise, active, noise-cancellation wave to reduce the noise up to 95 percent so your music comes in loud and clear. 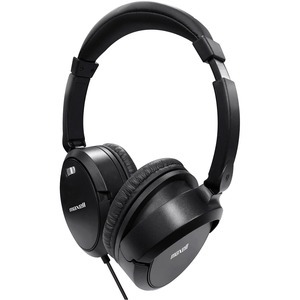 Lightweight headphones deliver more than 50 hours of use with two AAA batteries (not included). Headphones include a travel pouch and airline plug.